The Advances in Genome Biology and Technology (AGBT) Precision Health Meeting came together in the San Diego suburb of La Jolla in early September. 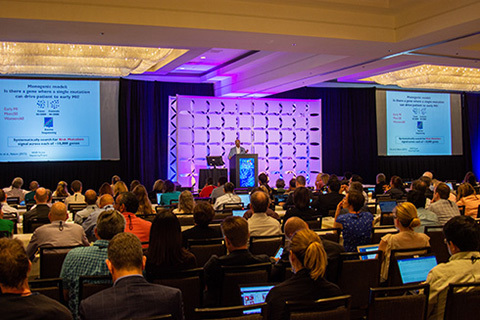 A spin off of the technology-focused AGBT meeting traditionally held in February, the smaller precision health conference is largely attended by researchers and clinicians working on the frontlines of genomic and precision medicine. The meeting is unique, in large part because of the field that it represents. Developments at the interface of genomics, medicine, and health are generating genomic and phenotypic information at a pace that scientists and clinicians in the field struggle to keep pace with. The impression given by the people in the field is that organizing and sharing the newly generated data is a lot like chasing a ball rolling down a steep hill. The list of speakers was a who’s who in the world of clinical genomics, including Marc Williams, M.D., from the Geisinger Genomic Medicine Institute, who gave an overview of Geisinger Health and how it is revolutionizing precision medicine in healthcare. Similarly, Robert Green, M.D., from Harvard Medical School and The Broad Institute talked about the MedSeq and BabySeq programs and what his team has learned about the line where genomic sequencing and public perception meet. Also, Stephen Kingsmore, M.D., wowed the room with the near miraculous diagnostics provided in less than 24 hours at the Rady Children’s Institute for Genomic Medicine. Mixed in with the big names and their stories that have become virtually synonymous with precision medicine, were talks from researchers making some of their early contributions to the field in emerging areas of precision health. These stories, which we highlight here, are the future of pre cision medicine. For example, precision psychiatry, exome sequencing to evaluate fetal anomalies and the clinical applications of population genetics. These topics are the offshoots of the pioneering work that has been done in the field, expanding the role of genomics in medicine. Is There a Future for Precision Psychiatry? Jordan Smoller, M.D., a professor of psychiatry at Harvard Medical School, started his talk by detailing how common psychiatric disorders are, affecting more than a quarter of the population in any given year and more than half of all people over the course of a lifetime. For that reason, Smoller said that there is an important future for precision psychiatry, despite being in its infancy and that, similar to the pioneering work that has been done in precision approaches to cardiology, progress is being made. He hopes that the tremendous resources like the Electronic Medical Records and Genomics (eMERGE) Network, a national consortium organized by the National Human Genome Research Institute (NHGRI) and UK Biobank will incorporate mental health data as hey grow, to enable more research.